Spray plants with a stream of water from a garden hose to dislodge the majority of the pests before applying insecticidal soap or other approved product. For effective control, follow instructions on the product label for an appropriate spray schedule. Whiteflies cannot survive freezing temperatures. They are reintroduced to northern regions each year on the wind and infested plants. 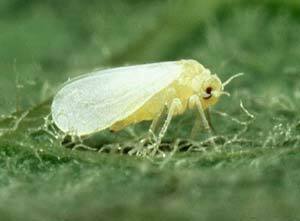 Check plants carefully for whiteflies before purchasing.